Wait a minute. There’s college football on right now? While this September Saturday marks the first weekend of the college football season, A Lot of Sports Talk will have to watch and admire it from afar. Things are getting real good here in Queens, as the 2016 US Open hits the weekend on its way to the turn to the back end of the tournament on Labor Day. Doubles play will continue to dominate the courts while singles matches will continue to pack the intrigue. Now if we can get tropical storm Hermine and its residual effects to stay away and not have to deal with any rain delays in the next couple of days. It’s time to hit the courts once again. As always, the most recent blog entries are on the top! 9:58 PM EST: Over on Ashe Stadium, Nick Kyrgios, while serving for the set, was broken by Illya Marchenko of the Ukraine, and it’s on serve. At the end of the changeover, looks like Kyrgios flexing right leg. Maybe a groin issue? 9:57 PM EST: Just as we get ready to back up and head to 17, I see on my screen Karlovic hitting a running forehand winner to break Donaldson and go up 5-3 in the third set. One game away form the match and Karlovic is serving? Good night, Irene! 9:53 PM EST: Only court that has action on it that’s not Ashe is Court 17, where Jared Donaldson is trying to claw his way back into the match against Ivo Karlovic, who’s up two sets to love. We’ll head there for a little bit before deciding to call it a night. 9:45 PM EST: At the Venus Williams press conference, and a real good question just asked by Courtney Nguyen of the WTA: After her diagnosis (Sjögren’s Syndrome) and not making it into the second weeks of tournaments for a little while after, what has been the trigger in making it deep into tournaments now? Seemed as if Venus was a little emotional before answering, and also wanted to hide that emotion from the assembled press. “Just a whole lot of will power,” said Venus, after a long pause. 9:23 PM EST: Late night sandwich? Why not! After that, probably going to Court 17. Maybe. Ivo Karlovic won the first set against American Jared Donaldson, and he’s up 6-3 now in the second-set tiebreak. Not looking good for the qualifier. And there’s the set! Karlovic up two sets to love. 9:14 PM EST: Game, set, match, Wawrinka! What an escape from the No. 3 seed. Not sure if Evans’ play will carry over past the US Open, but he definitely equipped himself well here, winning a couple of matches and taking out No. 27 Sascha Zverev in the second round. 9:05 PM EST: Now Evans down 0-40 on his serve. Then forehand wide from Evans and Stan breaks at love. 5-2 Wawrinka. Looks like the No. 3 seed is going to escape. 9:03 PM EST: At 1-4, Evans hits a winner, then chirps with the photographers in the photographer’s well. What’s all that about? But it must have helped. Evans breaks for 2-4. Maybe the lady above us knows something we don’t right now about a possible comeback. 8:58 PM EST: Just spoke with the lady above us gently urging on Evans. She sums up her reasoning in rooting for Evans perfectly: “Someone’s gotta bring it for him!” Enough said! 8:56 PM EST: Oh, by the way, my former co-workers and bosses at ESPN Magazine, George Milkov and Dale Brauner, showed up in the media seating area about 15 minutes ago and are now catching up! It’s a small word after all, right? 8:54 PM EST: Love hold for Wawrinka and it’s 4-0. There’s a lady two rows up from us screaming “LET’S GO, EVANS, LET’S GO!” Well, at least one person hasn’t quit on him. Frankly, she’s showing more faith in Daniel Evans than Daniel Evans right now. 8:52 PM EST: The wheels have fallen off for Evans and he’s been broken again. 3-0 Wawrinka, and fans are starting to leave Armstrong en masse. 8:35 PM EST: Second-serve ace from Stan for 9-8! Then Evans goes wide with a forehand!! FIFTH SET UPCOMING! 8:33 PM EST: Wawrinka dumps a forehand slice into the net! 8-8!! 8:33 PM EST: Evans ties it at 7-7. Then a couple of great defensive lobs forces error from Evans, and it’s set point again for Stan! 8:31 PM EST: Wawrinka, on a second serve, serves out wide to get Evans off the court, then hits a backhand winner to set up set point! 8:30 PM EST: Match point saved by Wawrinka with a forehand volley winner at the net! 8:29 PM EST: Double fault from Evans and it’s 5-5! Now Evans with match point after Wawrinka defensive lob sails wide!! 8:25 PM EST: At 4-3 to Evans, long rally ends with Wawrinka pushing backhand wide Two points away from the match for the Brit! 8:22 PM EST: wawrinka holds for 6-5, then Evans holds. TIEBREAK! 8:16 PM EST: Stan then sends a backhand wide and it’s deuce again. Evans then mishits a lob that falls on the line for a winner…then challenge from Wawrinka…AND IT’S LONG! Advantage Wawrinka. Crowd gets on its feet! 8:15 PM EST: Wawrinka wards off a break point and it’s back to deuce. Then an Evans forehand goes long. Then a loud “C’mon!” from Stan as he has game point for 6-5. 8:12 PM EST: Crowd is decidedly for the underdog. As a matter-of-fact, one of the spectators I stood next to before entering Armstrong said she was rooting for the underdog…in her distinctly New Jersey accent. 8:11 PM EST: Evans wins the next three points, including an overhead smash winner while backpedaling and a forehand crosscourt winner. 5-all. 8:09 PM EST: Great timing! We’re here on Armstrong, and Wawrinka is up 5-4 and up 15-30 on Evans’ serve. Two points away from a fifth set here. 7:40 PM EST: Talking and power walking at the same time! On our way to Armstrong, as Daniel Evans is only three games away from the match against Stan Wawrinka. After splitting the first two sets, Evans won a third-set tiebreak 8-6. It’s 3-3 in the fourth, Wawrinka serving. 7:30 PM EST: So we’re about to head back out onto the courts, as we had to wait until Yaroslava Shvedova’s doubles match to end before we could do an interview with her, which we wanted to do. And we did. And it’s fun! Stay tuned! 6:13 PM EST: Also have to let you know about Karolina Pliskova’s 6-2, 6-4 rout over Anastasia Pavlyuchenkova on the new Grandstand. A potential Pliskova-V. Williams Round of 16 looms if Venus can defeat Laura Siegemund later on this evening. 6:11 PM EST: Have been busy the past few minutes creating more photo galleries and templates. Hey, it’s all to give you an even better visual experience of what I’m witnessing here in Flushing Meadows! 5:23 PM EST: …there’s intrigue on Armstrong Stadium, as Daniel Evans has just taken the first set against Stan the Man. Great Britain has had a good tournament, with Jo Konta and Kyle Edmund making it to the Round of 16 yesterday, and Evans, whom we saw in doubles with Nick Kyrgios yesterday, is looking to join them. 4:59 PM EST: New attendance record at US Open Day Session today: 40,780. It breaks the record from…yesterday. Also, Lorenzi is up 5-2 against Murray in the second set. Forza, Paolo! 4:56 PM EST: Just had a great conversation with one of the reporters sitting near me in the media room, Bob Greene, about Gale Sayers and Wilt Chamberlain during their days at the University of Kansas. Greene also attended KU, and, as he’s talking to me about the time he covered one of Sayers’ games while he was at KU, I can’t help but think that he’s the type of person who has forgotten more things about sports than most people know! Definitely a pleasure just listening to him speak and reminisce. 4:40 PM EST: So Murray won the first set tiebreak against Lorenzi, then broke Paolo in the first game of the second set. Lights out, right? Wrong! Lorenzi breaks back, then holds for 2-1. Have to love the fight from the 34-year-old Italian, whose career tour earnings is about $47 million less than the 29-year-old Scot. 4:37 PM EST: Juan Martin del Porto is NOT PLAYING AROUND! He has triple match point on David Ferrer…and now the match!! The Argentinian smokes Ferrer, 7-6 (3), 6-2, 6-3. And how about this match-up in the Round of 16: del Potro vs. Thiem! 4:35 PM EST: Dimitrov closes out Sousa in four sets. The Bulgarian is doing his on-court interview now, and cameraman is only shooting Grigor, which is bunk because the interviewer on Court 17, Blair Henley, is just as awesome! Give Blair some air time, cameraman!! 4:26 PM EST: We might also make it out to the new Grandstand once again, as red hot Karolina Pliskova is taking on Anastasia Pavlyuchenkova. Pliskova broke to start the match, which usually isn’t good news since she possesses such a powerful serve. The Czech holds for 2-0 now. 4:23 PM EST: Fascinated by what’s going on at Aste, where Paolo Lorenzi, who looked like a beaten man at one point during his match on Thursday against Gilles Simon, has now forced a first-set tiebreak against Andy Murray. 4:21 PM EST: There’s no Roger Federer at this tournament, but the man once known as “Baby Fed” might do some damage here! 4:19 PM EST: Wow! Dimitrov just won a 34-shot point with a running forehand winner that caught the baseline! He now has break point…that Sousa fights off with an overhead smash at net. 4:17 PM EST: After another quick bite to eat, deciding where to go next, and it might be to Court 17, as long as we can make it in time. Not too long ago, Grigor Dimitrov was in the Top 10 in the world. Also, not too long ago, and not too long after the career high ranking, Dimitrov absolutely fell off the map. He’s found his form again and is just three games away from the fourth round. He’s currently leading Joao Sousa 6-4, 6-1, 3-6, 3-2. 2:45 PM EST: Back in the media room to take in a couple of matches and charge the laptop again. 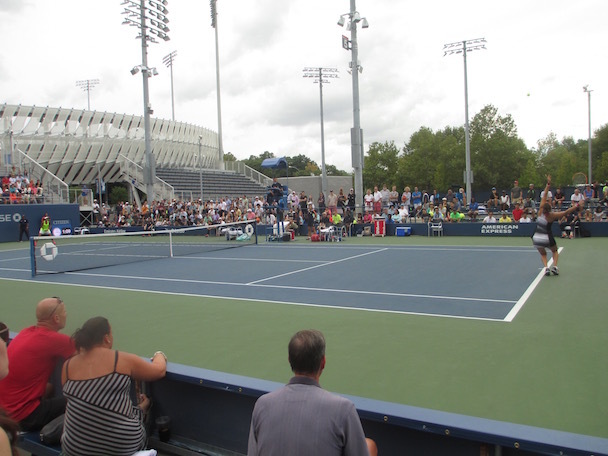 Varvara Lepchenko just forced a third set on the new Grandstand against Ana Konjuh. Oh, and Juan Martin del Potro just took the first set against David Ferrer on Armstrong. 2:34 PM EST: Game, set, match Shvedova! Zhang hits a return of serve into the net and Shvedova has now reached the fourth round of the US Open, a career best in New York. 2:33 PM EST: Shvedova clearly having trouble concentrating on her serve on the outer court, as she’s interrupted her routine a few times already because of fans walking around. Couple of announcements from chair umpire about spectators needing to take a seat have been made. Sit down, people!! 2:31 PM EST: Again, Shvedova is in trouble serving it out, and she just had to save a break point to get it back to deuce. 2:20 PM EST: Oops. Shvedova double faults, and Zhang evens the set at 5-5 with the break. 2:18 PM EST: Food done, and it’s off to our first live action of the day that we’ll witness live. We’re at Court 5 now, as Yaroslava Shvedova is up 6-2, 5-4 against Shuai Zhang of China and serving for the match. 2:15 PM EST: Food done, and it’s off to our first live action of the day that we’ll witness live. We’re at Court 5 now, as Yaroslava Shvedova is up 6-2, 5-4 against Shuai Zhang of China. 1:48 PM EST: I’ve arrived in the media room, and I immediately smell chicken. Also, I didn’t eat breakfast. FOOD NOW!